I just got back from leading an 8-day field trip studying the geology and environmental policy of the Colorado Plateau. The trip culminated with a 5-day trip down the Yampa river in Dinosaur National Monument. Thank you to the students, alumni, and guides from ARTA who made it a fun and educational experience. I've placed student abstracts and posters from the trip here. Geologists from Pioneer Resources visited NAU this week to teach a short course on seismic data interpretation. Students got to practice interpreting 3D reflection seismic data. Thank you to Pioneer and Paradigm for making this happen! My Applied Geophysics class went out to Peach Spring, Arizona this past weekend to assist the USGS Water Science center with field work. We used Controlled Source Audio Magnetotellurics (CSAMT), Transient Electromagnetics (TEM), and Gravity to better understand the aquifers that supply water to the Hualapai Tribe. Thanks to Jamie Macy, Jeff Kennedy, and the rest of the USGS Flagstaff Water Science Center for letting us join you. My students and I have been working with researchers from the University of Maryland and NASA to image the subsurface in the vicinity of SP crater, located north of Flagstaff in the San Francisco Volcanic Field. This field season we have been using magnetometers, broadband seismometers, NodalSeismic nodes, differential GPS, and a Propelled Energy Generator (PEG) to locate subsurface fractures that are hypothesized to serve as magma conduits for volcanic eruption in the field. Many thanks to PASSCAL for the use of the PEG. A magnitude 7.1 earthquake just occurred south of Mexico city. More information from the USGS is available on it here. What is unusual about this earthquake is its depth and the type of faulting. The earthquake occurred at ~50 km depth in a continental setting. Typically, within the interior of continents earthquakes do not occur at depths greater than ~10-20 km. Below that, it is so hot that rocks will flow and stretch instead of break. Also, this earthquake is extensional, which means the earth is being pulled apart, which is not common when subduction is occurring nearby offshore. So what happened? I think some previous work by researchers from Seoul National University and Caltech gives us some insight. To the right are two images from their paper published in 2013 in EPSL. The first is a map showing their seismic stations and a black line showing the location of their cross section (A-A'), which is shown the second figure. I've marked the approximate location of today's earthquake with a blue star. The second is their cross section of seismic velocity perturbations from the western edge of the continent to the Gulf of Mexico. This can be thought of as a CAT scan of the earth; the different velocities representing different materials and/or temperatures. I've added another blue star showing approximately where this earthquake occurred in the cross section. The black lines in this figure are their interpretation. The solid black lines are interpreted as the crust of the oceanic Cocos Plate subducting beneath Mexico. From these images it looks like the earthquake occurred in the subducting plate just where the subduction angle is steepening and the slab is bending. This bending places the top of the slab in extension is probably why the earthquake is extensional. The fact that the earthquake occurred at this depth is probably because subducting slabs are cold and are releasing water, both of which makes the earth break more easily. This is just my best guess of what happened here and future work will prove or disprove this idea. Figures from: Kim, Y., Clayton, R. W., Asimow, P. D., & Jackson, J. M. (2013). 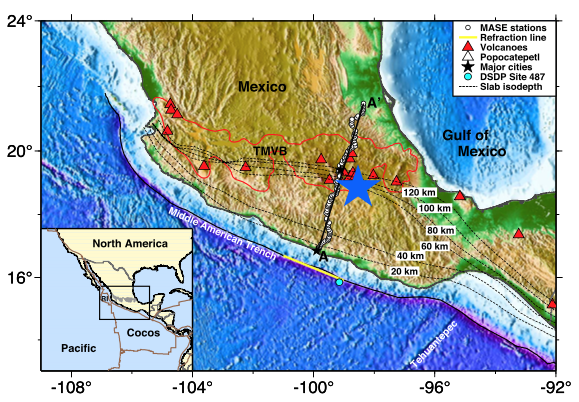 Generation of talc in the mantle wedge and its role in subduction dynamics in central Mexico. Earth and Planetary Science Letters, 384, 81-87. 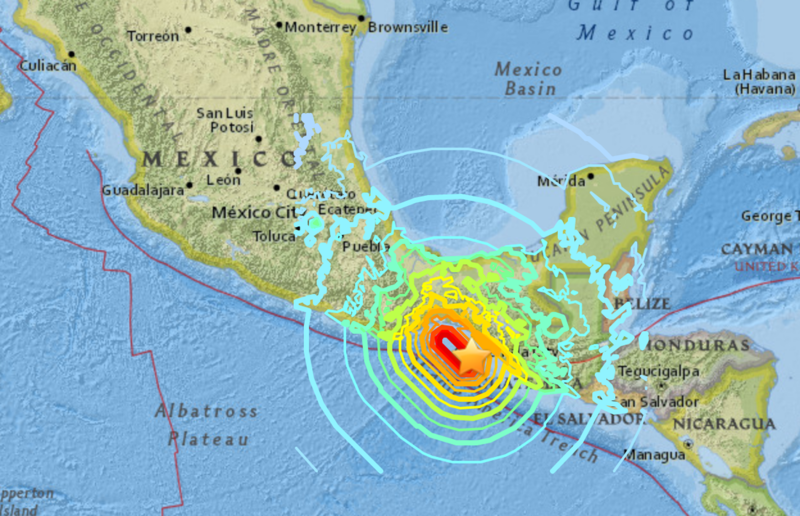 Late last night, southern Mexico was hit by an earthquake that occurred offshore near the border with Guatemala. According to the USGS, the earthquake was within the Cocos Plate and was at a depth of ~70 km. In this region, the Cocos Plate is subducting beneath the North American Plate. This was an unusual earthquake for this tectonic setting given its depth and the way the earth ruptured. Typically, earthquakes in subduction zones are caused by compression of two plates colliding and they usually occur at shallow depths. The seismic waves from this earthquake show that the earth was extending during the earthquake and that this earthquake happened at a relatively deep depth. 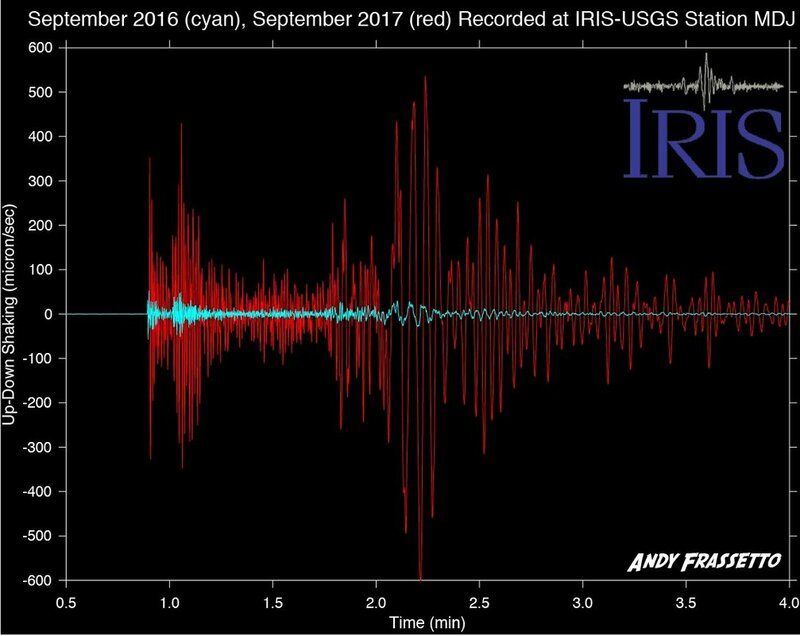 This earthquake will keep seismologists busy for a while. Just got back last week from a trip with my former roommate on the Babine river in British Colombia. The river was a 4-day, Class III+/IV- run through a remote part of Canada. We didn't see another person on the river, had marginal weather, and double-digit Grizzly Bear sightings. Grizzly rapid, the biggest drop on the section was full of salmon and had 9 bears fishing at it. NAU professor Micheal Ort and I recently taught a geophysics field course in the Serdán-Oriental volcanic field with colleagues from the Universidad Nacional Autónoma de México (UNAM). The course involved students from both NAU and UNAM Queratero and focused on using shallow geophysical techniques to understand the eruptive behavior of volcanoes within the field. The project was funded by a grant from the 100,000 Strong Initiative.